My great uncle Robert Sparrow leading stoker who, like so many others, went down with the Goliath. He was the only son of 12 children and my mother has a photo and a large, tea plate sized, medal which was given to my great grand mother. How do I find his seaman's record for my family history? I am a duffer at this web site game. 20 years ago my great aunt gave me a photo of my great grandfather. She told me he was on the HMS Goliath and his name was Harry Salisbury. I never gave the picture or the information much thought until…. one fateful night, my daughter and I were looking up World Events that happened on May 13th (my daughter's birth date) and to my surprise the Sinking of the HMS Goliath came up. We had found your Honour Roll for the HMS Goliath and there to my utmost shock was the name of my Great Grandfather list among its deceased. 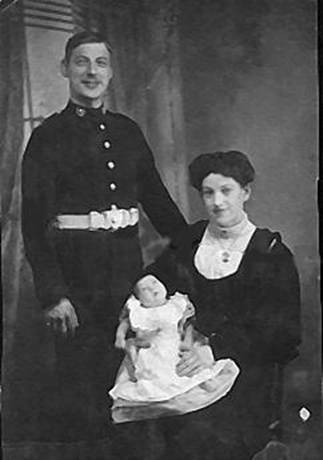 Please find attached picture of my Great Grandfather, Harry Salisbury, his wife Rose and their daughter, Caroline Rose Annie Salisbury. I have been looking at the photo of Harry Salisbury, who was lost on the HMS Goliath, can you put me in touch with Catherine please. Harry was my Great Uncle and the older brother of my Grandfather, Jabez Salisbury, who was decorated twice in WW1. I have extensive information on the family. I am looking for any information people might have about ROBERT JAMES KNAPMAN from Thorverton, Devon who died on HMS GOLIATH 13 May 1915 aged 22. He was in the Royal Marines Light Infantry. I am tracing my family tree and I am trying to find out if anyone has any crew photos that William H Tucker, Petty Officer 1st Class is in. I know his name is on the the Plymouth War Memorial but I have been unable to locate any pictures to date. Trying to find out about my great great great uncle EDWARD SIMPSON died aboard HMS Goliath. He hailed from Isle of Man. My Grandfather JOHN J. MORGAN Seaman RNR, listed on the HMS Goliath Roll of Honour, lost his life on 13th May when HMS Goliath was sunk in Morto Bay. I am going to the Dardanelles next month with the intention finding the site of the wreck paying my respects to the Grandfather I never knew. Sadly his son, my father, was only six years of age in 1915 and had a very limited memory of his father. If anyone has actually visited the wreck and can help me in my quest by telling me of their own experiences and pitfalls shall be very grateful. I am writing to you as webmaster for the HMS Goliath Message Board. I notice that message number 19, dated 25th August 2009, from Lyn Jones mentioned that Lyn was going to visit the Dardanelle in September. I would like to ask if this visit took place and to find out what happened. Would you pleas pass this message on and ask Lyn Jones to e-mail me. My interest is that my grandfather, CPO William Smith, died that night when the Goliath was sunk. 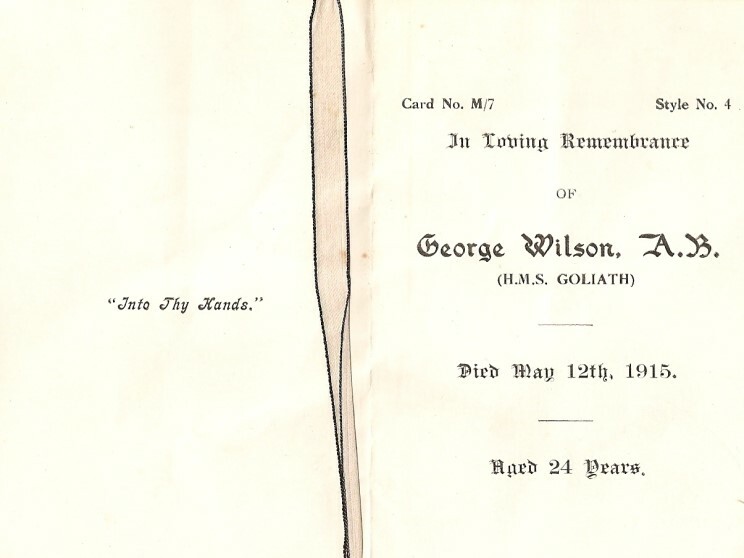 I have just come across a prayer remembrance book for George Wilson A.B., who was killed on the H.M.S. Goliath, age 24, on the 12th May 1915. He was not anyone in my family, as far as i know. Is anyone looking for information about him? I was looking for information about my own relatives, who were also killed in the wars. My great uncles were Edward Baty, a renewal gunner in the Coldstream Guards. He was killed in France on 21st September 1914. Also Joseph MacWilliam, he was in the Durham Light Infantry, and William Baty, he was a sailor. I have just found your site, quite by accident, but what an interesting site it is. I am researching my family history, and my Great Grandfather, John Dimond, Leading Stoker, lost his life on the Goliath 1915. When at home, he lived in Plymouth, Devon. He left a wife, son, and four daughters. Apart from a few notes in my Grandmothers diary, which she wrote as a child, I know very little about him. If anyone has photos of the crew, or other information, would they please contact me, through your site. I have spent several hours reading the message boards, and looking at photos. Well done collating so much wonderful information. My maternal grandfather (Tedbury) was lost with the Goliath. I have long had wish to visit Morto bay and the wreck but age and distance (from New Zealand ) and cost I may not get a chance. My daughter is leaving UK for a tour of the area in Mid March and any information on tours to the wreck or photographs would be appreciated. at crew pictures. I live in Coventry. I have just discovered that my great uncle Thomas Wilfred King died aboard HMS Goliath on the night of 13th May 1915. He was a Boy 1st Class and only 17 years old. Like others, I too would be grateful for any information or photographs of the crew. Great website. My Grandfather Peter Carroll was a Stoker on the Goliath. Are there any crew photographs available? My Grandfather, Leading Seaman W. H. (Bill) Gitsham 203708, was on watch in the hours leading up to the sinking of the Goliath. According to my father (I never met my Grandfather who died in 1926), despite the Turk's use of a Torpedo Boat to effect the attack, Bill sighted a periscope on 3 occasions in the hours leading up to the sinking. Each sighting was reported to the Captain directly in accordance with standing orders. On the third occasion the Captain was asleep and was not happy to be disturbed, calling my grandfather `a b' fool` in the words of my father. So convinced was my grandfather of the threat to the ship, he encouraged his friends from Broadclyst in Devon to sleep on deck that night. One friend was illiterate and relied on my grandfather to write dictated letters home for him. This poor chap went below to get an envelope as the three torpedoes struck. Those on deck survived and my grandfather became a much loved local here for his action in getting the lads from Broadclyst home safely. In a footnote to this story my grandfather was on another vessel in the English Channel later in the war when he saw what he thought was a man fall overboard. Very bravely, he dived in only to find that the "man overboard" was a body discarded from the ships mortuary. Apparently there was no ceremonial burial at sea for fear that a ship would become a sitting duck target. Neither did ships in time of war stop for "man overboard". Thus my grandfather found himself alone in the English Channel. Fortunately he must have been a good swimmer as he managed to remain afloat until a French fishing vessel came close enough for him to grab nets hanging over the side. The French had not seen him at this point and Bill was too exhausted to climb aboard. The French found him some time later wrapped in their nets safely above the waterline but with head injuries. Bill was taken, unconscious to the Military Hospital at Greenwich where, after some months, he made a full recovery and returned to ship at Portsmouth. Two old colleagues promptly fainted as he came aboard. My paternal grandmother's first husband, Joseph Ward, from Smethwick in the West Midlands, was killed by the sinking of HMS Goliath, when it was torpedoed on the 13th May 1915. He was serving as a stoker. Fate played a cruel hand for Joseph, as Goliath was not his ship. Due to his train being delayed he missed his own ship's departure, after returning for active service on the naval reserve, and was put on the next available ship which was HMS Goliath. His daughter Kitty is still alive, fit and active, living at home with her family at the grand age of 96 ! Joseph Ward from Smethwick was the brother of my great granddad Samuel Ward born 1892 who is my grandads dad and Gunivera Ward who is my grandmothers mom ( my grandparents were cousins) 1878, so these will be that aunt and uncle of your Kitty. This is so lovely - can I ask is she still alive? If she is can you see if she has any memory of them. It would be so lovely. I would love to hear from you as I am constructing my family tree. My great grandfather, Charles Forbes of Dundee, Scotland, was killed on the HMS Goliath on May 13, 1915. I have inherited his “dead man's penny” and his medals. He was only 23 years old. I am still trying to determine when he was deployed as it is unclear whether he ever met his only child (my grandfather). He was survived by his son William and his wife, Mary “Mae” Rhynd Forbes. I just happened on your website and enjoyed the photos of the HMS Goliath. My grandfather's brother David Rowe went down with the ship. All we have is a photo of him on the Goliath's deck in full uniform with a telescope neatly tucked under his arm looking very proud. The story of sinking was of great interest to us since the "older" folks didn't like to talk and remember about the loss. My great uncle William Webb was aboard HMS Goliath when it was sunk in 1915. Unfortunately he did not survive. Looking for more information and photos of crew. I have just read Roy Smith's message and a couple of years ago I was in contact with someone who was looking for photos of the crew of the HMS Goliath. Some how I lost contact and never got to send a photo. My Grandfather, Albert Henry Bowsher was a Stoker aboard the Goliath when it was sunk. Unfortunately he was not one of the survivors. Would like to hear from others researching the Goliath. 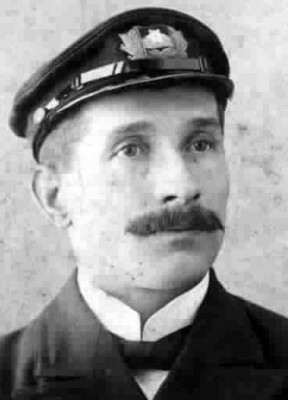 of have of him taken in Sidney, Australia in his uniform. I would be interested in anything else you can tell me. Have just read Roy Smith's message requesting photos of crew that drowned with the Goliath. My great-uncle, David Ockwell ('Uncle Dai'), was a stoker on the ship and went down with it. I came across an old photo of him, so will have a look for it. He came from Porthcawl area of South Wales, and was my mum's uncle. (My family were based in South Wales- Cardiff area). I have been on the web trying to find out more about the sinking as when mum told me about it it left an impact - particularly when I found his photo. I am researching and gathering material on my local village of Brithdir, in the Rhymney Valley, South Wales with the aim of writing the history of the village and its people. Your site has helped a great deal when I have been searching for information on those who lost their lives in the two world wars and wish to congratulate you on a wonderful site. I was recently researching a local sailor who sadly was killed when HMS Goliath was sunk in 1915. The more I learnt about his ship the more intrigued I became in the sad story of the sinking, so much so, I endeavoured to record all those that went down with the ship. Now that I have accomplished that I would now like to put a face to each name and wondered if you could help. I wondered if you could put a message on the HMS Goliath message board for me, requesting a copy of a photograph of those you were on board when she was torpedoed on 13 May 1915. Also could you please pass a copy of this to Lorraine Keilaus who has a message dated Sept. 5, 2007 on the HMS Goliath message board. Looking for information on my grandfather Frederick Keilaus who served with the Royal Marines on the Goliath and he was killed when it went down. Mrs. Rose Burnett is researching her family tree and is looking for any information of photos of ERNEST WOOD who served and died on HMS Goliath. My friend Beryl Soper is looking for a photo of her grandfather Edward Nelson Coles who was a Royal Marine aboard HMS Goliath and died when it was sunk 13th May 1915. Any assistance or information would be greatly appreciated. We have recently discovered your Goliath message board and have a connection to Edward Nelson Coles, he was my great uncle. His brother, Harold Lewis Coles was my grandfather. I saw the message above from 2007 concerning a Beryl Soper, who was Nelson Coles' granddaughter. (He was always referred to as Nelson, not Edward, by my grandfather.) How possible is it to get a message to Sue Todd or Beryl Soper? I had no idea Nelson had any children so it would be nice to know who they are. We have recently discovered your Goliath message board and have a connection to Edward Nelson Coles, he was my great uncle. His brother, Harold Lewis Coles was my grandfather. I saw that a Sue Todd had left a message on 2007 concerning a Beryl Soper, who was Nelson Coles' granddaughter. (he was always referred to as Nelson, not Edward, by my grandfather). How possible is it to get a message to Sue Todd or Beryl Soper? I had no idea Nelson had any children so it would be nice to know who they are.